Rotating food storage is the best way to ensure that the food you have stored will be edible and as fresh as possible when you need to use it. And the best way to rotate your food storage is to use it to make food on a regular basis for yourself and your family. But that can be a little daunting for many of us. How do we even use this stuff? 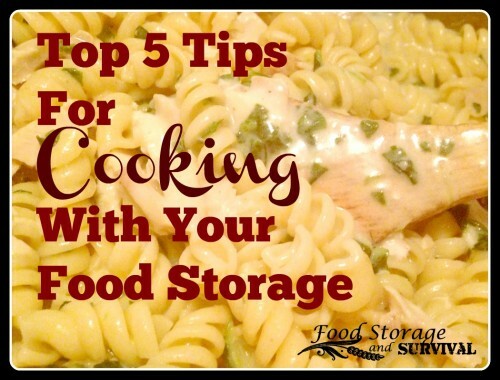 I’ve been incorporating food storage into my everyday meals for many years and want to share my top five tips for cooking with your food storage with you. 1. Store foods you will eat. This may seem obvious, but it is one of the main reasons that food storage does not get used. Start by storing foods that your family already eats. Then, when you want to add a new food to your storage, learn how to use it so it won’t just sit on your shelf gathering dust. 2. Canned foods are already cooked. If you have home canned or commercially canned foods like vegetables, fruits, meats, or soups, these foods are already cooked. This means you can eat them right out of the can if you need to. It also means that if you are cooking with them, all you need to do is get them warm and they’re done. 3. Dehydrated foods take longer to hydrate than freeze dried foods. Freeze drying is different than dehydrating, and as a result, the freeze dried foods are quicker to re-hydrate than their dehydrated counterparts. Most dehydrated food needs cooked in hot liquid (water or broth) for ten minutes or longer in order to soften, while the majority of freeze dried foods can be hydrated in under a minute using water that is either cold or hot. 4. Powders can be reconstituted or added dry to the dry ingredients. Products like powdered milk, powdered eggs, powdered shortening, powdered butter can be reconstituted prior to use in a recipe or they can be added dry to the dry ingredients of the recipe, and the recipe’s liquid increased by the amount that would have been used to reconstitute the powder. So if I need an egg in a recipe, I can either mix the egg powder with water and then add the wet egg to the recipe or add the dry egg powder to the dry ingredients like flour and then increase the amount of liquid in the recipe by the amount I would have mixed with that egg powder to make a reconstituted egg. 5. Experiment. This is probably the most important step. Not every recipe you try to make with your food storage is going to turn out amazing. You will have some that are good, others that need improvement, and some that are really bad. It’s best to do that experimenting now while you have back up options for dinner! Each time you cook with your food storage, you’ll gain that much more experience and will know what works and what your family will enjoy eating. You may end up finding that your food storage foods become your everyday foods! Looking for some good resources for using food storage? Check these out! Food Storage for Self-Sufficiency and Survival by me – Last chapter is dedicated to using your food storage and walks you through how to create shelf stable recipes from your own family’s favorite recipes. The Prepper’s Cookbook by Tess Pennington – Lots of recipes using food storage items from powdered milk to Spam. My Food Storage Cookbook – Awesome website with loads of shelf stable recipes plus food storage cooking tips. Shelf Stable Recipe Book download at Food Storage Made Easy – Collection of shelf stable recipes submitted by their readers available as a free download. Thrive Guide – If your food storage contains freeze dried foods, Thrive Life has published an exceptional guidebook on ways to use their foods in everyday cooking which could also apply to freeze dried foods purchased from other companies. What about you? What are your top tips for cooking with your food storage? Great article about food storage Angela, you make it look so easy! I love your new book too!